Query from potential lawyer – what are my chances? I wonder if you can help me. I am a mortgage advisor with two to three years experience and I want to know whether it is worth me taking the law conversion course to qualify as a solicitor. What are my chances of getting a training contract and how easy will it be for me to qualify? Will it be a waste of money? This was a query raised yesterday by a caller. It’s quite a common query for people to want to raise as the cost of the conversion course is so extreme. There are very few other professions that get away with charging so much money to their potential intake in order to qualify. In fact, teachers get paid to train and so do doctors. Surveyors don’t seem to have to spend so much money and neither do architects. However lawyers get hit for rather an extreme amount. It is not even clear why the colleges have got away so long with the legal practice course being so expensive. These days with a good proportion of legal aid solicitors earning less that the other trades surrounding them (florists, plumbers, police officers, prison officers and social workers) it’s not clear why anyone would want to spend so much money doing the legal practice course when their potential earnings at the end of it are so restricted. The question as to whether there is any merit in starting out in a legal career and what the prospects of success are is virtually impossible to answer, particularly in the current climate of potential change over the next few years. If you have your heart set on being a lawyer, the best thing to do is go and see exactly what it is a lawyer does in practice. If you are aware of what a lawyer does and are still interested in becoming a solicitor, you then need to go and consider where you want to go with the law. Do you want to be a solicitor, a barrister, practice in non-contentious law (i.e. commercial contracts, conveyancing, commercial property or wills and probate etcetera) or contentious (crime, civil litigation, family and personal injury). Do you want to practice in a commercial environment, in house or London city or regional commercial, or do you want to practice high street where there is lots more hands on practical experience dealing with people on a daily basis? Have you considered a local authority role or a government post or perhaps you have got your eyes set on the military litigation work that arises out of that? If any of this means anything to you, it’s probably a good indication that you have looked into a potential career and considered your options. If the vast majority of this means nothing to you at all, the chances are you are actually not sure at all as to what a solicitor does in practice and now maybe the time to go and experience it. Similarly, with barristers, and particularly with the harsh and fierce competition there is to get a chambers place and to qualify as a barrister. My experience of chambers leaves me somewhat dubious as to the merits of some of the recruitment as when I was in practice, the local chambers had two pupil barristers, both of whom were daughters of members of chambers. That particular chambers must have had 100s of applications and it is simply not possible for both those appointments to be on merit alone. Things are different in the solicitor's profession, because solicitors’ children do not necessarily want to go into the law and are probably discouraged from doing so by their parents on the whole. I suspect they get a full dose of reality as to what exactly a lawyer does and that can be helpful in deterring them away from the profession, which the likes of me and you probably do not have, hence the constant influx of people like this mortgage advisor wanting to convert and join the profession, when in fact he could probably earn more as a mortgage advisor (or stacking shelves in Tesco’s at times). This may present a somewhat jaded and cynical view of the profession, but it is not intended to. I am simply trying to point out the practical side of the law and the need to understand exactly what it involves before creating some sort of romantic notion in your head and setting off at high speed to qualify as a solicitor without really thinking through the consequences. In recent times it has become a common query on our careers site for advice on alternative career options for conveyancing lawyers. In one way it is quite interesting how people get very worried in blips like the current market dips so quickly and don’t look at the longer term side of things. It is clear that there will be conveyancing jobs sooner or later, as housing markets do not tend to just collapse and never come back again. People still need to buy and sell houses, and there are also people out there who want to buy houses to let them out, particularly if the market drops and a lot of houses become available at quite a cheap price. However the query is often that they don’t want to practice in conveyancing anymore and what other options are there out there for conveyancing lawyers. The same thing happened last year when crime solicitors started to feel the pinch with the Pleasant report that was so well written by Lord Carter came into force and gave the legal services commission the excuse to slash costs even further, reduce a lot of crime solicitors to penury. 1 Wills and probate – this fits quite nicely with conveyancing and often some conveyancers have some experience already dealing with wills and probate work and do not need any alternative training. However if alternative training is required there are now training companies out there who are cashing in on the recession by offering four day diploma courses to anyone wanting to convert. We are starting to see applications from obvious conveyancers looking for wills and probate posts and claiming to be proficient after attending this course. We are not entirely sure how this could be possible. 2 Move into property development work – this seems to be a common choice as well, although in the current climate there are hardly any or few property development companies recruiting as far as I can see. 3 Move into a completely field of law but stay within in the legal profession – this can be easier for conveyancers than other lawyers, as conveyancing can sometimes be coupled with other fields and you may have come across somewhere already that is relevant. For example, a lot of conveyancers pick up a bit of family experience or commercial property or company commercial. These can be fairly straightforward to move into, providing you are prepared for an inevitable salary drop and drop in status. In the current climate however, this is difficult to achieve. 4 Consider moving completely out of the law and into another field entirely – this has been quite common over the years, even when the market is booming and I know of conveyancing solicitors that have moved into fields such as in house company departments, company commercial work, even airport work and opening their own café. There are lots of choices for conveyancers and just because the market is poor it does not necessarily follow that there are no jobs out there to be had. What you have to bear in mind though is that in the present climate the crunch on recruitment is probably affecting every field and profession, and it does not necessarily follow that because there are no vacancies in conveyancing, that there will be vacancies in other fields elsewhere. Sometimes it is better to sit tight and ride out the dip, and see what comes up when the market starts to pick up again. We have certainly noticed that in crime, as things have settled down after the Carter report and recruitment picked up once again as firms needed solicitors. If you are very worried about your current position and the threat of redundancy is causing you a lot of stress, it might be worth speaking to Law Care (www.lawcare.org.uk) who have specialist advisors able to give you advice and support at this difficult time. Be reassured it is not just you that is under the threat of redundancy – we have seen sporadic outbursts across the UK of redundancies, that have included all areas of the country, and at all levels of experience in conveyancing. Jonathan Fagan is Managing Director of Ten Percent Legal Recruitment. He regularly writes and commentates on the state of the legal job market and the legal profession. You can contact him at cv@ten-percent.co.uk or visit the website at www.ten-percent.co.uk. 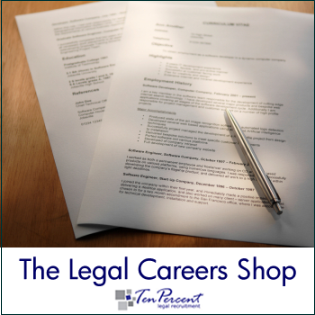 Should I spend thousands on going through the Legal Practice Course? I received a request for help yesterday from a law student approaching his final exams and wanting to know whether he should commit to doing the legal practice course and spending the thousands of pounds on it and getting into lots of debt. He explained that he needed a commercial loan in order to do this. The advice in such circumstances is very simple. If you know what it is that a solicitor does and have good work experience, expect a 2:1 degree and are fully committed to a career in law, then yes, you should spend the money to do the LPC even if you do not yet have a training contract lined up. A lot of people get their training contracts whilst they are doing the LPC and it is fairly common to finish doing the LPC and then get placed. If you have no legal work experience, and are not entirely sure that you want to be a solicitor or have a predicted third class degree or low 2:2 with no hope of getting a 2:1, I would strongly advise you to think twice. Competition to get training contracts is intense. Competition amongst 2:2 and third class degrees is extremely intense. Competition amongst people with first class or high 2:1’s is not as tight at all. If you think about it, the vast majority of training contracts go to students who have good work experience, a consistent academic background with good results throughout their careers to date. As a result, their competitive standard is a lot higher than somebody with a 2:2 or a third class degree with no work experience and poor academic records. The competition amongst these people is intense, because a lot of firms simply will not consider them. So my advice really divides into the two, if you fall into the first camp of student then clearly, yes, you should be applying for the legal practice course and you should be looking for training contracts. If you fall into the second camp then I would advise against it and instead go out into the legal profession and get work experience as it is this work experience that is likely to result into you falling into a career path, whether this being as a trainee solicitor doing a part time study contract whilst doing a training contract or working as a legal executive or paralegal. You may even find that perhaps the law is not for you, as if you have struggled academically and do not really enjoy the law in practice you may want to consider an alternative career in any event.